A physics project to do the next time you have an infinite number of books. 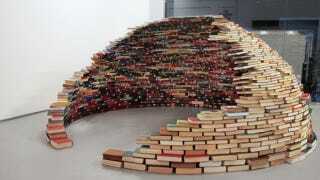 How far can you stack a 'stairway' of books, outwards from the ledge of a table? 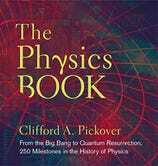 This is the problem that consumed physicists for over two hundred years. The answer? Forever — if you have enough books. Find out how this paradox gave rise to many ancient structures, and some structures that we can still see today. Imagine a supply of books, all equal height and weight. You stack them into a leaning tower, each book offset slightly, hanging over the edge of a table. Soon you have quite the overhang going. Idly, you wonder, how far can you go until the tower collapses. The answer is, 'forever.' The Leaning Tower of Lire is also called the "infinite-offset paradox." In physics, many things can be shrunk down to their center of mass. The center of mass is the average position of all the points of mass in a body. It doesn't have to be in what an observer would estimate as the center of the body. In fact, it doesn't even have to be inside the body at all. High jumpers will curve their bodies into bows as they pass over the bar. The average of every point in their body is in the air below the 'bow,' so that while every part of their body passes over the bar, their center of mass will pass under it. Thus it is that the Tower of Lire is teetering on a table top, with certain parts jutting over the edge and certain parts still firmly on top. It needs support, but as long as its center of mass is above the table, and therefore supported, it won't topple. A visceral way to get the physics of situation is simply drawing an imaginary line on the floor (or by getting up on your table or desk, if you want to go Dead Poet's Society). Stand on one side of the 'edge,' and reach a hand over it. Start by sticking your hand out only slightly over the line. Odds are, you're not being careful, and letting your body lean out. Extend your hand a little. Then a little more. The more you extend your hand and arm outwards over the line, the more your body is going to roll back into a vertical position behind the line. If you don't compensate with a big hunk of mass one one side of the line for one part of you reaching far out into space, the average of the two will tip over the line, your center of mass will be unsupported, and you'll fall. But the books in the stack, you say, aren't connected the way your body parts are. Actually, that doesn't matter. As long as the tower is pressed together by gravity, it will follow its own center of mass. To make one long extended arm over the edge of the desk, you have to build a massively solid 'base' of books that will draw the tower's center of mass away from the outlier and pull it back onto the desk again. The farther the arm reaches, the more books will have to be stacked to serve as the base. The formula for calculating the number 'n' of books required for a certain reach is simple. The reach, in book-lengths, is equal to 0.5 x (1 + 1/2 + 1/3 + 1/4 + . . . + 1/n). There's no upper limit for n, so this can go on as long as you have books to do the reaching. It won't be easy to get the supplies. Many people do the Tower of Lire with playing cards, just to save time and arm strength. Fifty-two books (or cards) will allow for an overhang of 2.25 book-lengths. An overhang of three book lengths will need 227 books. An overhang of ten will require 272,400,600 books. This sounds like an isolated experiment done by physics and math nerds, and it is — but that doesn't mean we don't see its application in everyday life. Entire domes have been built out of books as a practical demonstration of the power of the tower. It's also the physical basis for other structures, especially round structures like domes and arches. Anytime people have had to build up an arching structure, they've applied these ideas of center of mass versus reach — even if they didn't know they were doing it. The wider the stretch of the curved ceiling overhead, the thicker and higher the walls have to be to keep the whole thing from collapsing over on itself as its being built. Anything built with bricks, blocks, or tiles, will trace its way back to exactly this way of comprehending what makes a structure solid. Via Wolfram and The Physics Book.